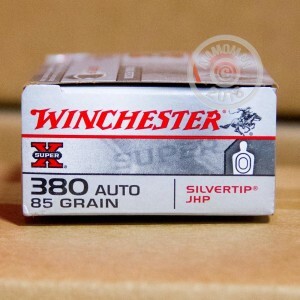 Winchester Silvertip ammunition is a proven choice for self-defense. 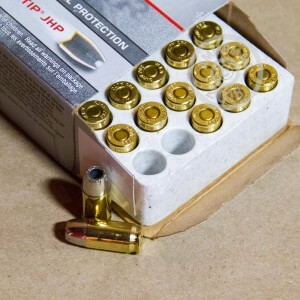 Load this .380 ACP ammo into your SIG P238, Glock 42, Ruger LCP, or other .380 Auto pistol for assured performance. Each cartridge in this box of 50 fires an 85 grain jacketed hollow point bullet at a muzzle velocity of 1,000 feet per second. This combination of a light projectile and a relatively high velocity helps ensure more reliable expansion. This ammunition is loaded in Oxford, Mississippi using non-corrosive Boxer primers and brass cases. Orders over $99 at AmmoMan.com come with free shipping!